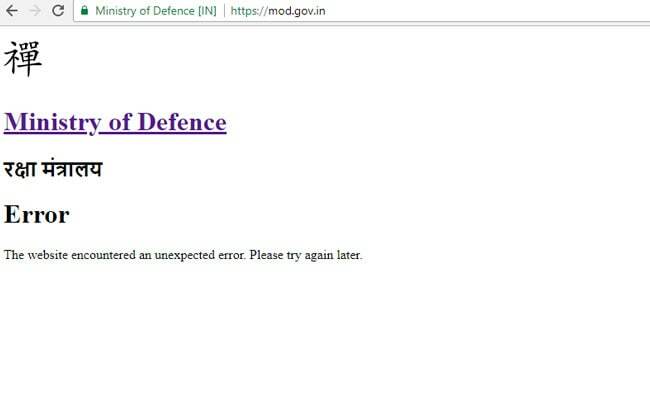 After Defence, Law And Home Ministry Websites Down, Official Says "Hardware Problem"
Defence, Law And Home Ministry Websites Down, Official Says "Hardware Problem"
The Defence Ministry has initiated a probe and says the website will be restored shortly. The websites of the defence ministry, home, law and labour ministries crashed this evening around the same time, which raised suspicion that these had been hacked. But a top cyber security official emphatically denied any hacking and blamed the snag on a hardware problem. First the defence ministry's official site started leading to an error page and had a Chinese symbol thought to mean "Not early". Moments later, the home, law and labour ministry websites were down. "The site is currently not available because of technical problems. Please try again later. Thank you for understanding," said a message on the home website, informing that the site was offline. A few hours later, the websites were restored. It was initially thought to be a case of hacking, especially after a tweet from Defence Minister Nirmala Sitharaman, but a cyber security official countered it. "There is no hacking of any nature anywhere in the Defence Ministry website. There is hardware problem due to which the website is down. It will be up shortly," Gulshan Rai, National Cyber Security Coordinator told NDTV. "Due to malfunctioning of storage network system, websites of few ministries is down and will be up soon," he added. Defence Minister Nirmala Sitharaman tweeted to say that her ministry's website will be restored shortly. "Action is initiated after the hacking of MoD website. The website shall be restored shortly. Needless to say, every possible step required to prevent any such eventuality in the future will be taken," she tweeted. Sources said the National Informatics Centre, which maintains all government websites, was asked to investigate. The ministry's suspicion was linked to the Indian Air Force announcing that it is holding some of its largest-ever wargames specifically designed to deal with the simultaneous threat posed by the Pakistani and Chinese Air Forces. The glitch also comes on a day the government - in fact on another part of the Defence Ministry website - officially released the Request for Information (RFI) for more than 100 new fighter jets in a deal eventually expected to cost upwards of a 100,000 crores. Indian government websites have come under attack from suspected Pakistani hackers in the past. In January, suspected Pakistan-based operatives had hacked the website of National Security Guard (NSG) and posted anti-India content and comments against the Prime Minister. Earlier this year, the government informed the Lok Sabha that over 700 websites linked to the central and state governments were hacked in the past four years. Experts attributed the frequent hacking of Indian websites to lack of adequate security measures in the virtual world.